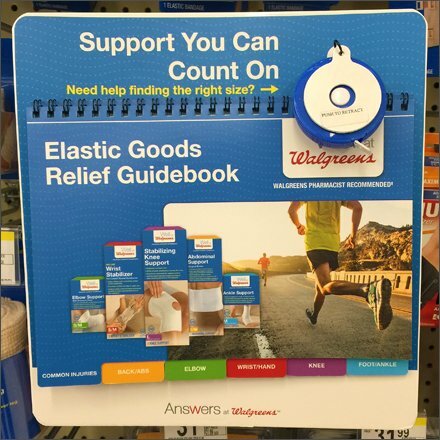 Walgreens® offers a tethered In-Store Measuring Tape to help you get the size of assistive supports right in-store. A color-coded Tabbed Guidebook gives all the merchandise details for all those troublesome parts of the human anatomy … back, abs, elbow, wrist, hand, knee, foot and ankle. You barely need a doctor. For things that make your head hurt, go to the analgesics aisle. 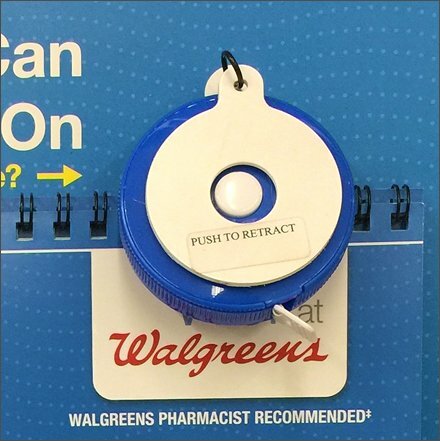 CLICK the thumbnail for a tape measure and tether cloceup along with the reassuring tagline “Pharmacist Recommend.” I find Pharmacist advise ALWAYS good, and I can talk to one far easier than trying to see my doctor. This In-Store Measuring Tape seen at Walgreens, Wilkes-Barre PA.